Synopsis: Tessa O'Connell is a girl as ordinary as they come-or so she thinks. Her aim for senior year is to keep her head down yet somehow manage to convince her childhood love Jay Stone to love her back. What she isn't prepared for is for Jay's brother, Cole, to return to town and change the life she's always been seemingly content to live. Tall, gorgeous as all hell and a bad boy with ocean blue eyes and the perfect edge of adorability, he was her greatest tormentor, her number one enemy. But the guy that's come back is like no one Tessa's ever come across. He challenges her, he tests her limits, he forces her to bring out the girl she's long ago buried under a veil of mediocrity and most of all he compels her to consider that perhaps the boy that infuriates her to the point of no return might just her guardian angel. I am torn with how to rate this book so I didn’t, I enjoyed the overall story but I didn’t like how it all came about. Tessa has loved Jay Stone for a long time but it was his step-brother Cole who always paid her attention, not often in a good way; he was a bully and tormented her growing up. When he left town for military school it was a relief for her so when he returns after a number of years he is nothing like the person he was when he left and it beyond confuses her. I liked Cole in the now, his character (until the end) made me really fall for him, I was glad we didn’t meet the tormentor that he was. I found Tessa to be annoying and quite whiny; she had a lot of self-doubt and insecurities which stemmed from the bullying, not only from Cole as children but now from her ex best friend Nicole. Her obsession with Jay was also annoying, he was spineless and didn't stand up for her when his girlfriend would be a torment; he was all about popularity. Tessa had a lot to deal with throughout the book, parents going through a separation, an alcoholic brother, bullying, a lack of confidence and anxiety; I felt the author dealt with it well. The aspect I didn’t like was how the bullying was justified, it didn’t sit right with me at all; Tessa fell for a boy who had always infuriated her, yes he was a child when it was all happening but I can never condone intimidation and mistreatment of any kind and have it warranted as harmless no matter what age they are. Without this aspect, I enjoyed the progression of their relationship and how Cole came to support, defend and gain her trust. Tessa had some great friends but she also had some enemies, Nicole and her clique being the main ones. Travis was interesting and I would love to read a book from his POV, Jay constantly grated on my nerves but I adored his mother. I didn’t like the ending at all, I did instantly search Amazon to start on the second book just to see what would happen (but I couldn’t find it). Overall, without the bullying aspect and the ending I would have preferred this book a lot more. I enjoyed the authors writing style and I thought Cole kept things entertaining despite his past. 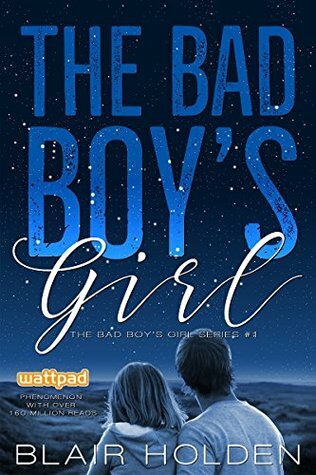 Thank you to Trident Media Group via Netgalley for the opportunity to read and review The Bad Boys Girl. I agree I don't like to see bullying justified. You have me a tad curious about the ending Sharon! Oh I'm an ending girl and not liking an ending can be a deal breaker for me as well. Brilly review and I totally get why you didn't rate it. I've had books that hit me the same way.